In order to better examine the true insanity of what many people now term “social justice warriors,” I must study a few aspects separately. First, let’s take a brief look at the mindset of your average social justice circus clown so that we might better understand what makes him/her/it tick. I spent several years (up until 2004, when I woke up from the false paradigm madness) as a Democrat. And before anyone judges that particular decision, I would suggest they keep in mind the outright fascist brothel for the military-industrial complex the Republican Party had become at that point and remains to this day. Almost every stepping stone that Barack Obama is using today to eradicate the Constitution was set in place by the Bush dynasty, including the Authorization Of Military Force, which was the foundation for the National Defence Authorization Act and the legal precedence for indefinite detention without trial of any person (including an American citizen) accused of terrorism by the president of the U.S., as well as the use of assassination by executive order. The left gave the police and government a rationale for being draconian, while we removed the need for police and government entirely by providing security for the neighborhood (killing two birds with one stone). Either their methods are purely ignorant and do not work, or their methods are meant to achieve the opposite of their claims. In the end, the PC movement only serves establishment goals toward a fully collectivist and centralized society. I personally do not care if two people of the same gender want to be in a relationship, but I do find the issue of gay marriage (and marriage in general) a rather odd conflict that misses the whole point. Marriage has been and always will be a religious institution, not federal; and I find government involvement in this institution to be rather despicable. When the Supreme Court’s decision on gay marriage came down, I felt a little sorry for all the joyfully hopping homosexuals on the marbled steps of the hallowed building, primarily because they essentially were fighting for the state to provide recognition and legitimacy for their relationships. Frankly, who gives a rip what the state has to say in terms of your relationships or mine? The state is an arbitrary edifice, a facade wielding illusory power. If a relationship is based on true and enduring connection, then that is a marriage of sorts, whether the Supreme Court says so or not. The only advantage to solidifying gay marriage in the eyes of the state is the advantage of being able to then use the state as an attack dog in order to force religious institutions to accept the status of gays in the same way the government does. And unfortunately, this is exactly what the PC cult is doing. PC champions desperately try to make these questions a matter of “discrimination” alone. But they are more about personal rights and property and less about “hate speech.” Under natural law, as well as under the constitution, an individual has every right to refuse association with any other person for any reason. If I do not like you, the government does not have the authority to force me to be around you or to work for you. But this line has been consistently blurred over the years. As I’m sure most readers are familiar, the issue of gay cakes seems to arise over and over, as in cases in Colorado and Oregon in which religiously oriented business owners were punished for refusing to provide service for gay customers. Punishments have included crippling fines designed to put store owners out of business and have even included gag orders restricting the freedom of businesses to continue speaking out against the orientation of customers they have refused. My response? First, to be clear, I am talking specifically about private individuals and businesses, not public institutions as in the argument explored during Brown v. Board of Education. Private and public spaces are different issues with different nuances. I personally believe it is ignorant to judge someone solely on the color of his skin, and sexual orientation is not necessarily an issue to me. But it is equally ignorant for someone to think that the state exists to protect his feelings from being hurt. I’m sorry, but discrimination is a fact of life and always will be as long as individualism exists. The PC cultists don’t just want government recognition of their status; they want to homogenize individualism, erase it and force the rest of us to vehemently approve of that status without question. This is unacceptable. If a business refuses to serve blacks, or gays, or Tibetans, then, hey, it probably just lost a lot of potential profit. But that should absolutely be the business’s choice and not up to government to dictate. And in the case of “gay discrimination,” I think it is clear that the PC crowd is using the newfound legal victim group status of gays as a weapon to attack religiously based organizations. Make no mistake, this will not end with gay cakes. It is only a matter of time before pressure is brought to bear against churches as well for “discrimination.” And at the very least, I foresee many churches abandoning their 501(c)(3) tax exempt status. If a group wants fair treatment in this world, that is one thing. I believe a gay person has every right to open his own bakery and bake gay marriage cakes to his little heart’s content. I believe a black person has every right to dislike white people, as some do, and refuse to associate with them or serve them if that’s what he/she wants. I also believe that under natural and constitutional law, a religious business owner is an independent and free individual with the right to choose who he will work for or accept money from. If he finds a customer’s behavior to be against his principles, he should not be forced to serve that person, their feelings be damned. A man shaves his head and eyebrows, straps a plastic bottle to his face, and has his feet surgically modified to resemble flippers: Does this make him a dolphin, and should he be given victim group status as trans-species? I’m going to be brief here because I covered this issue in a previous article, but let’s lay everything on the table, as it were. PC cultists are clamoring to redefine the fact of gender as an “undefinable” and even discriminatory social perception. No one, no matter how dedicated, will ever be able to redefine gender, unless they have the ability to change their very chromosomes. Nature defines gender, not man; and a man who undergoes numerous surgeries and body-changing steroid treatments will always have the genetics of a man even if he gives the appearance of a woman. Take away the drugs, and no amount of make-up will hide the chest hair growth and deepening voice. This might be deemed a “narrow” view of gender, and I don’t care. Nature’s view of gender is the only one that counts. Psychological orientations are irrelevant to biological definitions. Are you a man trapped in a woman’s body? Irrelevant. A woman trapped in a man’s body? Doesn’t matter. If we are talking about legal bearings, then biological definitions are the only scale that makes sense. I realize that gender bending is very trendy right now, and Hollywood sure seems to want everyone to jump on that freaky disco bandwagon, but there is no such thing as gender-neutral people. They are not a group, let alone a victim group. There are men, and there are women; these are the only gender groups that count. Whether they would like to be the opposite does not change the inherent genetic definition. Period. To make such foolishness into an ideology is to attempt to bewilder man’s relationship to nature, and this will only lead to disaster. A person determines his success in life by his character and his choices. Color does not define success, as there are many people of every color who are indeed successful. Do you have to work harder to gain success because you are brown, or black, or neon green? I’ve seen no concrete evidence that this is the case. I know that people who identify as “white” are still around 70 of the American population, thus there are more white people in successful positions due to sheer numbers. I also find it a little absurd that most PC cultists who harp about so-called white privilege are often white themselves and haven’t the slightest experience or insight on what it is to be a person of color anyway. White privilege seems to be the PC cult’s answer to the argument that racism is a universal construct. Only whites can be racist, they claim, because only whites benefit from racism. I defy these jokers to show any tangible proof that an individual white person has more of a chance at success than a person of color due to predominant racism. Or are we just supposed to have blind faith in the high priests of PC academia and their morally relative roots? Marxism (collectivism) uses many vehicles or Trojan horses to gain access to political and cultural spaces. Once present, it gestates like cancer. Younger generations are highly susceptible to social trends and are often easily manipulated by popular culture and academic authority, which is why we are seeing PC cultism explode with the millennials and post-millennials. In my brief participation on the left side of the false paradigm, political correctness was only beginning to take hold. A decade later, we have a bewildering manure storm on our hands. 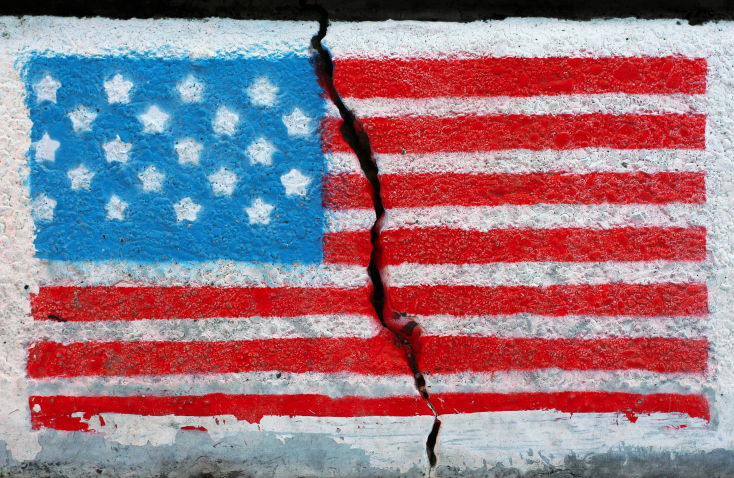 The result is a vast division within American society that cannot be mended. Those of us on the side of liberty are so different in our philosophies and solutions to social Marxists that the whole carnival can end only one way: a fight. And perhaps this is exactly what the elites want: left against right, black against white, gay against religious and straight, etc. As long as the PC movement continues to do the bidding of power brokers in their efforts toward the destruction of individual liberty, I see no other alternative but utter conflict. Yes, endorsing group rights is all about avoiding individual responsibility. BUT THERE WON’T BE A FIGHT – BECAUSE PC GANGSTER TAKERS ARE BUSY FIGHTING TRYING TO PROVE “I’M BETTER THAN YOU!! !” BUT MAKERS ARE TOO BUSY MINDING THEIR OWN BUSINESSES! I doubt there will be a fight, because the Makers, by our very natures, CAN NOT RESIST EVIL MEN, simply because we’re trying to hope to collaborate to objectively solve universal problems, while the Takers – the PC (Psychopathic Criminal) negligent, delinquent libertine “liberals” are all focused on their fears, and obsessively “PMS“ing about it all the time – since they don’t believe in winning, they spend all their time trying to not-lose, to prove “I’m better than you!” all the time, by attacking innocent others first. They are Paranoids (“They’re all out to get me!”) Masochists (“I’d better focus on my fears AS pain, lest I forget to defend myself, since hope is a trick!”) and Slanderers (“Since they’re all out to get me, I’d better get all of them, first!”). Political correctness (i.e: factual incorrectness) is extortion – fraud and slander – in that it pretends a civil ‘probable’ test applies, based on group-might-made-rights scenarios, to all aspects of life: white males are always to be ‘legally’ and ‘defensively’ pre-judged as “guilty until never proven innocent,” for instance. It’s extortion, and extortion is always a crime! PC pretends one is responsible to other people for their (possibly mistaken) reactions to one’s new ideas, or to ideas which *might* offend them. And the offense taken, is always subjective. Since the deliberate use of PC implicitly slanders people AS being offensive, it attacks first, and therefore also inherently defends first-attackers (criminals). PC implies one can and so should manage or avoid others’ inevitable reactions of denial (automatic ‘offense’) to one’s exchange of ideas, as if one somehow ‘should,’ even if one could, always try to defuse all of their normal psychologically procedural reaction stages (i.e: basic thinking) as summed up by Elizabeth Kubler-Ross. Normal people WILL REACT to new ideas BY a well-established process of denial to acceptance, so it’s literally outrageous to posit that any one person is responsible for monitoring, or has a duty to actively prevent this common thought process occurring in others. So obviously, “Political Correctness” is only an extortion attempt at THOUGHT CONTROL, designed to shield criminals’ crimes, and to prevent everyone from thinking at all, beyond the most shallow and banal trivialities. It defines the willfully ignorant and irresponsible, criminally negligent “victimology” process. It is to insist (as all authoritarian extortions do) that one must ALWAYS Submit one’s self to the greater (gang’s “might-makes-right”) good. What is currently misconceived as ‘altruism’ and ‘Hegelian dialectics’ is really only a lie: a slanderous fraud designed to induce perpetual guilt in the victim, by way of the same, ages-old “carrot-and-stick,” fear-and-greed behavioural conditioning binary. It’s proponents sadistically advocate for perpetual, self-sacrificing masochism in others, demanding they pacifistically agree with the predatory criminal aggressor’s militaristic notion that they have no right to self-defense, nor even to think about planning for it. To them, if their victims even THINK about planning to defend them selves, it’s “slandering” the criminals AS the aggressors, (which they in fact already ARE, just by dint of their PC extortion-attempts). Bottom line: criminals hate other people (potential victims and/or potential opponents) thinking about their crimes, just as they hate the admitting to them selves of being criminals. And hating thinking has always had a perfectly valid label: “Psycho-Path” (literal translation: “Thought-Killer”). “PC” (Psychotic Criminal) “Liberals” are all about the “PMS” (Paranoid Masochistic Slander). While debtors, creditors, and economists focused on the Greek debt crisis, a report by European Commission President Jean-Claude Juncker with the heads of four other EU institutions went almost entirely unnoticed. Juncker proposes a predictably awful strategy for solving economic problems, greater centralization of power over the currency union’s economies. It recommended “quick fix” steps that could be introduced in the next two years, such as setting up a common bank deposit insurance system and promoting competitiveness, as well as longer term ideas, such as a common eurozone treasury. You can see how one might reach such a conclusion. If one entity is going to control the money supply, an economic manipulation tactic often used by governments to smooth over economic problems, then one can see the reason in having that entity exercising greater economic controls over the economic policies that lead to such problems. It doesn’t make a great deal of sense for example, to have Greece spend without regard for consequences, while French and German taxpayers end up on the hook for their irresponsibility. The flaw in this line of thinking however is that it begins with the assumption that the centralization which has already occurred is a good thing. It ignores the fact that said centralization is the only reason French and German taxpayers are on the hook for Greek debt to begin with. If other European countries are unhappy with their being bound to a nation irresponsible enough to address a debt crisis by electing communists, then ceding more control over their economies to a central authority hardly seems like a sound solution. The proposal is entirely predictable however. “Never let a good crisis go to waste” as they say in Washington. Governments have this terrible habit of rewarding failure. “Oh, you completely failed to accomplish the purpose for which your bureaucracy was created? You must need more money and power”. Forget the fact that Greek GDP growth was cut roughly in half since entering the Euro. That little piece of evidence would dissuade people from favoring greater centralization. Definitely pay no attention to the fact that the same can be said for Italy, Spain, and Portugal, that would not favor Juncker’s proposal. By the EU’s reasoning, an institution which fails to centrally plan the economies of a single political unit, will somehow be able to centrally plan the economies for an entire continent and beyond. The search continues for a one-handed economist. Some know-it-all guru who can figure out how a policy change from a single city will impact the economic behaviors of hundreds of millions of people with diverse interests over millions of miles of territory. The problem with such a strategy should seem obvious. There are just too many variables for any man or group of men to even attempt to contemplate. We all have to make economic decisions every day. Everything from investment strategies to what we eat for dinner. Contemplating the variables for all of these things in each of our own individual lives is very complex, to the point that many of us will hire experts to handle them, and even then there are failures. How one comes to the conclusion that multiplying that complexity by hundreds of millions of times over will somehow simplify the equation, or lead to greater prosperity, simply escapes reason. In the United States, we often see the deleterious effects of such flawed thinking. It is bad enough when your local government creates some economic policy that might negatively impact your business or favor some competitor. Luckily, you have the option to leave that place. This becomes more difficult when that policy is implemented at the state level, and damn near impossible when it is tackled by the federal government. Let the federal government go and enter into economic treaties with foreign nations, and the problem becomes even more difficult to escape. This trend toward centralization is fueled at best by ignorance, and at worst by malice. Far from creating greater prosperity, centralization only makes bad policy more difficult to escape. One of two things is true. Either that is the goal of such policies, or the people who claim to be uniquely qualified to dictate the economic behaviors of hundreds of millions of people over millions of miles of territory, are so incompetent that they can’t even see the obviousness of that fact. Tom Woods gave a great talk about secession earlier this year in Houston. The talk was not specific to economics, but the overall results of large centralized States, versus that of smaller autonomous ones. Unsurprisingly, large centralized states have a terrible habit of bringing immeasurable misery, poverty, and death, while smaller autonomous ones tend to thrive. The further removed from the individual responsibility becomes, the greater the tragedy that follows. If smaller autonomous nations fare better than large centralized States, how much better off would we all be, if States went away altogether, and individuals were free to make their own choices? You are currently browsing the Vladdi's Blog blog archives for July, 2015.